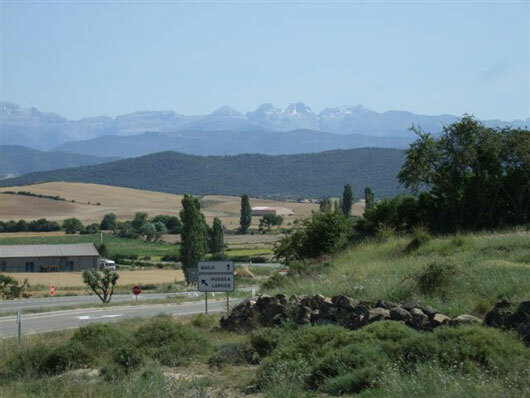 After setting off from Bilbao we headed for Gastiel and our first coffee break, then on to Pamplona and Zaragoza which was the first stopover, all the while taking in the beautiful scenery as we went. We did not use the toll roads but went the picturesque way instead. I have never seen so many eagles as I have on this trip. The roads are marvellous. Lots of bends to glide down and climb, the pace was around the 55-65 mph, nice and steady with plenty of time to reach our destination. Next morning we took in Huesca and Llieda where we stayed the night, passing the most wonderful pale blue lake. Then to Barcelona, a wonderful, colourful and vibrant city. It was teeming with Harleys heading to the show to collect passes etc.. The show lived up to expectations and then some. Lots of very good bands and plenty of bars - a great time had by all. 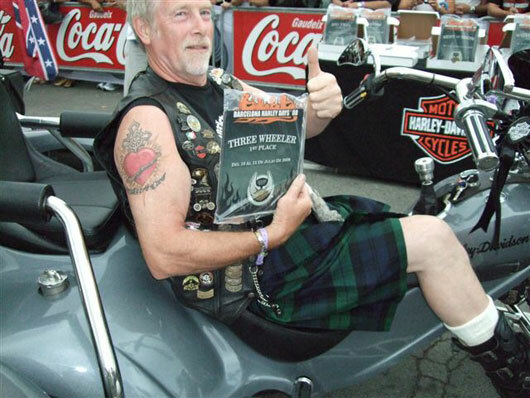 Upon entering the Custom Show Arena I was pleasently surprised to find I had won the Best Trike (three wheeler) award. I met up with the Posse Riders just after they arrived, what a ride they had approx two and a half weeks hard riding along with long days. After the show we headed for Sitges (now that’s an eye opener) as we still had a week left, then to Casteldefels, Vila Nova, Reus and then back to Llieda, Pamplona and Bilbao. Great weather everday except for the Saturday night at show where it poured down for about two hours, but the atmosphere just kept getting better. Met lots of new friends inc. the Webmaster of Madrid Chapter and riders from Duneedin chapter, overall a brilliant two weeks were had.